Notre Dame has found its new head football coach. Cincinnati head man Brian Kelly will be the Fighting Irish’s new leading man after accepting an offer just eight days after saying on a radio show in the Queen City that he planned to stay with the Bearcats for the foreseeable future. Apparently, eight days was all he could foresee. Understandably, Kelly’s decision did not sit well with his now former charges. Cincinnati is undefeated and scheduled to play Florida in the Sugar Bowl on New Year’s Day. Kelly had just led the Bearcats to their best season in the school’s history, and many players were not pleased that Kelly had led them this far just to leave them before the biggest game in the program’s history (Kelly began work at Notre Dame this afternoon. 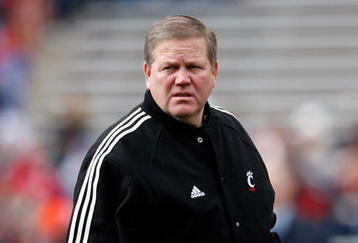 UC offensive coordinator Jeff Quinn will be the head coach of the Bearcats in the Sugar Bowl.) Kelly told his team about his decision at the team’s banquet last night, but by the time he told the players, the news had already broken nationwide. The players were nonplussed, to say the least. But as disappointed as the players are, this decision was an easy one for Kelly. Just think about this: Cincinnati just went undefeated and they are not playing for the national championship. That would never happen to a Notre Dame team that managed to navigate the regular season without losing. As good as Cincinnati has been, they are still regarded as a college football lightweight, while Notre Dame is still, despite a spate of losing seasons, one of college football’s bellweather programs. Not to mention that Notre Dame can pay a Kelly a lot more that Cincinnati can. We feel for the Bearcat players. We understand why their feelings may be hurt. But was a move that Kelly had to make, and it’s not at all surprising that he did just that.